A Little League coach accomplishes his goals of introducing the joy of baseball to another generation. 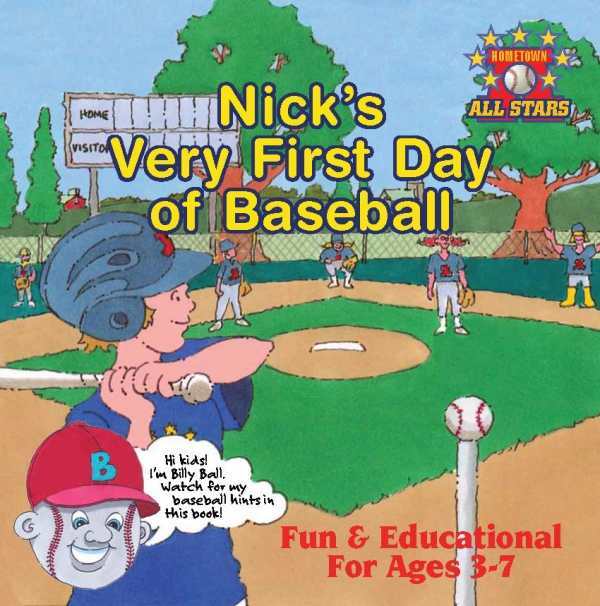 First-time author Kevin Christofora calls the completion of Nick’s Very First Day of Baseball a dream come true, and the starting point of a Hometown All Stars series of children’s books designed to instill a love of baseball in youngsters. While indications that the small business owner and Little League coach is a fledgling author keep this initial offering from being a home run, it is easily a stand-up double to the outfield wall. The essential elements of a children’s book are here: a strong central character in the eager-to-play Nick; a story that teaches and engages; and mind-expanding vocabulary and concepts. Particularly enjoyable is a character named Billy Ball that shows up on multiple pages to make the text interactive, and step-by-step illustrations of the baseball team’s warm-up exercises are sure to get kids on their feet and moving—another stated goal of Christofora’s work. The tale of young Nick’s first foray into baseball is complemented superbly by Dale Tangeman’s vibrant full-page illustrations, but there are a handful of times when the choice of white text over the detailed illustrations can make for a busy presentation and text that is difficult to read. The cover of the book indicates that it is fun and educational for ages three to seven, a large span to target content. The book itself feels like two volumes intended for different age groups, each strong on their own but tainted as a combined effort. The first ten pages feel more like a picture book for the younger crowd, each with a quick one or two sentences of text explaining Nick’s excitement leading up to his first practice. The remainder of the book is considerably more text-heavy and seemingly intended for an older audience with its detailed recap of what happens at the practice. There are even brief passages that an adult reader would interpret as tips for a youth baseball coach, concepts that seem a bit superfluous for a five-year-old preparing to swing a bat for the first time. While Nick’s Very First Day of Baseball could benefit from narrowing its intended audience, it still accomplishes Christofora’s goals of introducing the joy of baseball to another generation and encouraging them to put down the game controllers and get off the couch.